DONAJI, Mexico (AP) - After three grueling weeks walking along highways and hitching rides, thousands of Central American migrants traveling in a caravan through southern Mexico were told Friday that they would soon be leapfrogging ahead to the nation's capital in buses only to have their hopes dashed almost immediately when the offer was pulled. "It is very important that they be able to move soon from Veracruz toward another place," Yunes said in a video message released in the evening. "For that reason, we also offered them transportation so that, if possible, tomorrow ... they may be able to go to Mexico City or to the place they wish." During an evening assembly, caravan organizers told the migrants that they would be leaving around 5 a.m. for the capital in dozens of buses, apparently enough to accommodate the several thousand people in the group. "We are all going!" one the coordinators told the group. But then Yunes released a second video saying that because Mexico City's water system was undergoing maintenance and much of the city would be without water over the weekend, it would not be correct to send the migrants there. "I want to offer the migrants that while this problem is being resolved they accept my invitation to go to a city in Veracruz" that has the conditions to host them, he said. Migrants expressed surprise and disappointment at the decision. The offer of buses to Mexico City and the subsequent reversal came after the migrants' request for buses to the capital were ignored by the Mexican government days earlier when they were in Juchitan, Oaxaca state. 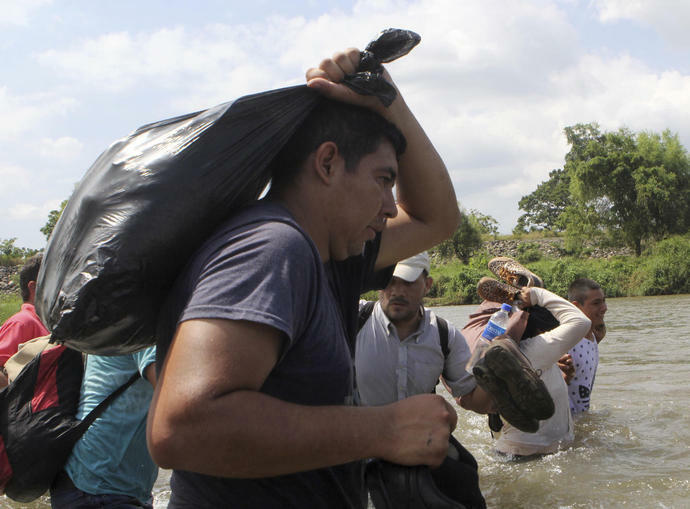 Earlier in the day, a third caravan of migrants - this time from El Salvador - waded over the Suchiate River into Mexico on Friday, bringing another 1,000 to 1,500 people who want to reach the U.S. border. Though the first caravan once numbered as many as 7,000, it has shrunk significantly. It has been hard to know their exact numbers as people scatter across highways and in small towns. Mexico's Interior Department estimated that, as of Friday, it numbered only 3,000 people. Other estimates had it around 4,000 or more. It remained unclear how many migrants would make it; 20 days of scorching heat, constant walking, chills, rain and illness had taken their toll. Mexico's Interior Department says nearly 3,000 of the migrants in the first caravan have applied for refuge in Mexico; hundreds more have returned home. "I have been through a lot," said Guzman. "I want to spend my time differently, not in poverty." In his hometown of Ocotepeque, Honduras, he left behind a coffin, either for his mother, who suffers dementia, "or for me, if I don't make it," Guzman said. Trump says has told the U.S. military mobilizing at the southwest border that if U.S. troops face rock-throwing migrants, they should react as though the rocks were "rifles." He also plans to sign an order next week that could lead to the large-scale detention of migrants crossing the southern border and bar anyone caught crossing illegally from claiming asylum. Former Gov. George Allen, R-Va., on the state of the Chinese economy and its impact on the U.S. trade negotiations with China.